(Newser) – With lethal-injection drugs in short supply and new questions looming about their effectiveness, lawmakers in some death penalty states are considering bringing back relics of a more gruesome past: firing squads, electrocutions, and gas chambers. Most states abandoned those execution methods more than a generation ago, but to some elected officials, the drug shortages and recent legal challenges are beginning to make lethal injection seem too vulnerable to complications. How about going really old school , back to the days of the Roman Empire. Most states have state universities with large stadiums , a few cages , some lions and tigers your good to go. Think of all the marketing possibles for the state , admission fees , food sales , memorabilia , etc. it's a win win. The gas chamber is a horrible way to die. 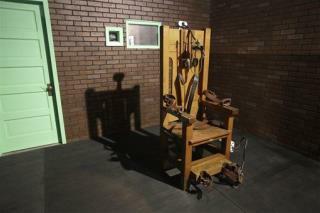 The electric chair isn't much better. If properly done, a firing squad is pretty quick. But a guillotine is faster yet. But if lethal injection is desired, why not OD them on heroin or the like?